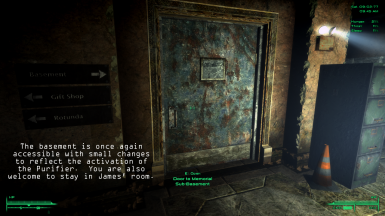 Adds the basement back into post-Project Purity Jefferson Memorial and allows you to use James' room as a player home. 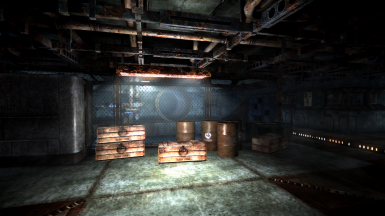 Also adds a key to Scribe Bigsley's private room and access to his personal stash. 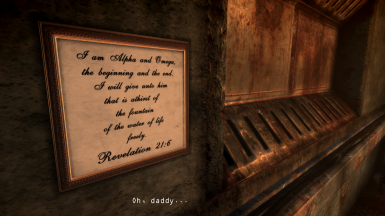 Your father had a dream for the wasteland...and he gave his life to save you. You activated the Purifier...and nearly sacrificed yourself in the process. You have graciously helped Scribe Bigsley with his water delivery issues...and he remains an ungrateful pr*ck. Paybacks are hell. Scribe Bigsley seemingly never sleeps, but he has a small closet of a room where his keeps a few choice items hidden from the Brotherhood. 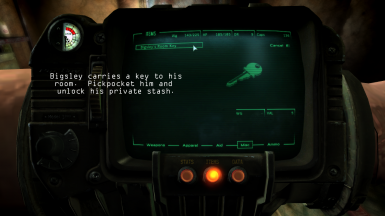 Pickpocket the key from him and unlock his stash. If you are feeling vindictive and don't mind the negative karma hit, help yourself. In short, this makes the impossibly large subbasement accessible again and allows you to freely use James' old room for your own. I have created DLC03PPurity04 as a separate cell to reflect the aftermath of the activation of the Purifier, so you will not see these changes until after the MQ is complete. The changes are honestly very subtle. Paper litter and blood have been removed, as well as food cans. Weapons that were available before the final battle are no longer there. Some oddball clutter is gone, not all though. There are a few Aqua Pura barrels and crates in the pump room. It looks like life is progressing at Project Purity. James' room is largely untouched. 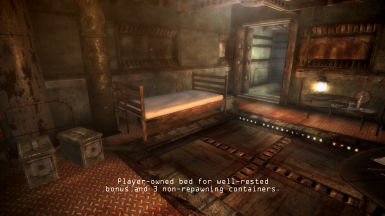 The regular bed was changed for a player-owned bed, and three containers are allowed for storage. The picture of he and your mother, Catherine, sits on the table. Otherwise, the room remains as your father left it before his death. Scribe Bigsley is carrying a key to his room, which is located in the museum. Steal it from him, and you have access to a few things that he's squirreled away to use as payment. You will get negative karma for stealing, however, so be warned. He is a jerk, but he's still one of the good guys. 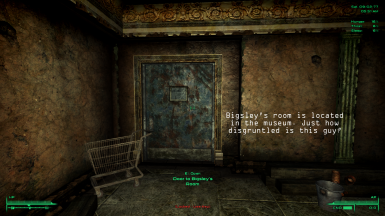 The main floor of the Memorial is still a mess, as this is largely due to Bigsley's inability to organize himself. No clean-up was done there and I left it as the developers intended it. In addition to adding Bigsley's room, I also added a bit of light in front of his desk so he's not shrouded in darkness. 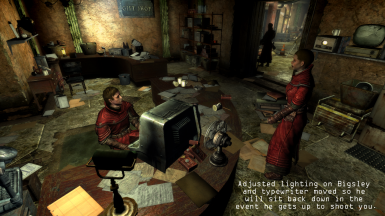 I also moved his typewriter and fixed the navmeshing around his chair, which previously prevented him from sitting back down on the occasions he got up to kill you. Simply drop JeffersonMemorialREDUX.esp into your data folder and activate it in the launcher, or use FOMM. It uses 100% vanilla assets and does not require FOSE. Delete it when you no longer desire it. This is a 'dirty mod.' I was unable to have it cleaned it without large portions of the Jefferson Memorial completely disappearing. 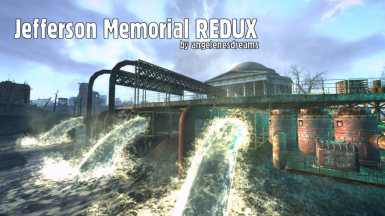 However, as long as you don't have any mods that alter the interior of the Memorial, all should be fine. If you want to translate this into another language and/or upload to another site, you have my permission, please credit me. If you want to use this as a base for a larger mod, go for it, please notify me (for my own curiosity) and again please credit me.